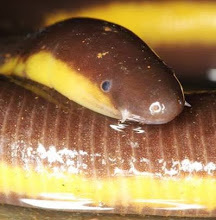 Caecilian amphibians are one of three orders of Modern Amphibians (Gymnophiona, Anura, and Caudata). They superficially resemble snakes, earthworms and eels because they are legless, and have long slender bodies with visible concentric rings. A blog by Varad Giri on caecilians of India. Contains great teaching and identification resources. Caecilians are found in moist, tropical regions of the world: Central and South America, Subsaharan Africa, India and Sri Lanka, The Seychelles, and Southeast Asia (up to the Wallace Line). Caecilians are mostly terrestrial, burrowing underground in soil, or moving through leaf litter on the forest floor. Some species are semi- or fully aquatic, living in freshwater streams and lakes. 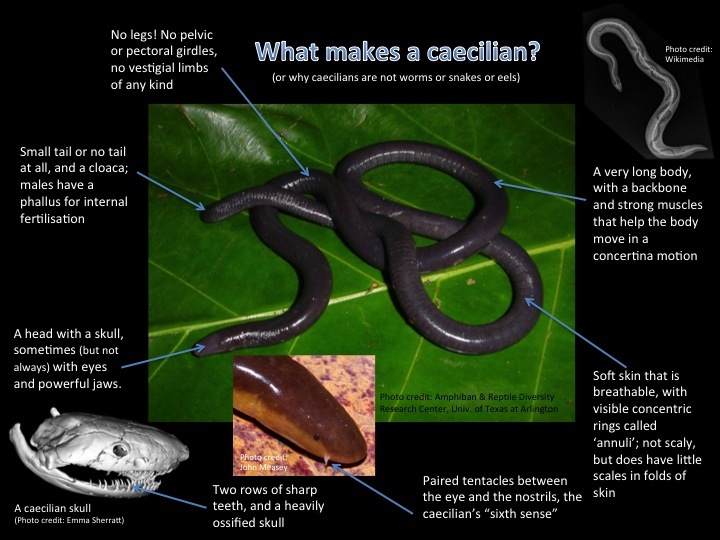 Learn about caecilians in this informative article by Roberta Kwok. Download the TimeTree of Life Article about caecilians here. They look like worms! Do caecilians have a backbone? - Yes! Caecilians are vertebrates, meaning they have a stiff rod running the length of their body. They also have a skeleton, that comprises a skull, a backbone with ribs, and sometimes a very small tail. The do not have legs, nor do they have the pectoral or pelvic girdles. - No. Their skin, like other amphibians, is not scaly like reptiles and fish, or hairy like mammals, but smooth and porous (breathable). It is soft to touch, and can be moist, but not unpleasant slimey feeling.